Hack The Planet - Hack The Planet! This Is Our World Now. This Version of Hack The Planet was officially loaded on 9.15.15: The 20th Anniversary of the Theatrical Release of "Hackers". In 1995, the film "Hackers" changed the game for pop culture, as the world previously knew it. It brought the cyber punk movement, emerging technology and the concept of "hacking" to the forefront of people's minds. Starring Jonny Lee Miller, Angelina Jolie, Jackie Bracco and Fisher Stevens, it helped define the cultural landscape of the final part of the 20th century, and influenced the future, setting the precedent of media to come after it. The unprecedented soundtrack, consisting of Hackers, Hackers 2 and Hackers 3 was released over the course of several years following the film's theatrical release, and helped define and grow the electronic music movement. It all still maintains a growing and solid following, 20 years later. In honor of the 20th anniversary, Hackers was released on special edition Blu-ray, by Shout! Factory on 8.18.15! 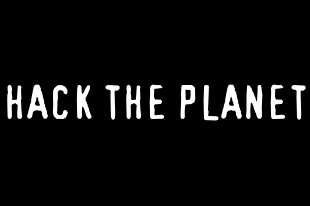 Due to high demand, we're currently offering an initial limited run of "Hack The Planet" stickers. Find original Hackers merchandise and memorabilia, including posters, press kits, soundtracks, and more. © COPYRIGHT 1999-2019 HACKTHEPLANET.COM. ALL RIGHTS RESERVED.